To qualify for our school rate, the visit must be booked by a school teacher on a school visit, visiting from an official registered school. Groups of students do not qualify for the school rate if they are making a general visit to the Zoo (i.e. without a teacher). Nurseries, Preschools, Playgroups, and Daycares do not qualify for our school rates and are instead included in our group rates. Please see the group booking page for more details. Students and teachers must enter the zoo together as one group to benefit from these discounted rates; we do not print out individual tickets. We require all schools book in advance, which can be done via our school booking form. Please note that when booking your visit it is fine if your numbers are estimates. We will confirm your exact final numbers of pupils and adults on the day of your visit. ***VAT at 20% is included in these prices which goes directly to the Government. Click here for our page with further details about accessibility. Paying by cheque – Cheques for payment are only permitted for local authority groups and should be made payable to Colchester Zoo Ltd. If your numbers change after your cheque has been written (e.g. a child is sick on the day and doesn’t attend), a refund for the difference can be provide in cash at the till at the time of payment. However, this must be made obvious at the time of payment as the refund cannot be issued at a later point in time. Paying by invoice – Invoices are sent out to the school after your visit after confirming exact final numbers on the day, invoices cannot be sent in advance of your trip. Invoices for payment can only be issued to local authority groups. Please note, there is an admin fee of £10 (incl VAT) for schools requesting to be invoiced. Please note that any pupils who qualify for carer places (as detailed above) are provided free adult carer at a 1:1 ratio and therefore these pupils will not count towards your free adult ratio. Children using Zoo Passes (gold cards) may enter free of charge, but do not count towards your free adult ratio. Primary children must be in supervised groups at all times. Children in year groups 7, 8 and 9 must also be in supervised groups at all times and should not, under any circumstances, be allowed to go off in groups on their own. Responsible students in year groups 10 and over can be unsupervised. Please ensure that your unsupervised pupils either wear school uniform or an identity badge with the school logo on so that we know which school leader to call in case of any problems. Schools have the option of purchasing Goody Bags in advance at just £2.00 per child (or bag). Just add your requirements to the booking form and these can be arranged for you. 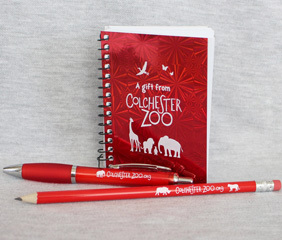 Colchester Zoo requires two weeks notice that you wish to purchase these. If you have ordered Goody Bags please collect them at the Outpost Shop, on the day of your visit, as you are leaving the zoo.